Valerie Free, conservator at Bishop Museum, examines the feather pa'u (skirt) of Princess Nahe'ena'ena, a grandchild of Kamehameha I, at Bishop Museum. 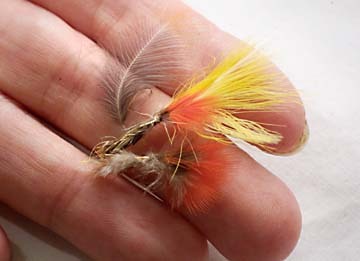 Feathers are mainly those of 'oo (yellow and black) and i'iwi (orange). The 200-year-old skirt measures 58.5-by-124 inches. » A story about the feather cloak owned by Chiefess Nahi'ena'ena that ran on Page D1 Tuesday said incorrectly that the princess was Kamehameha's granddaughter; she was his daughter. The Hawaiians weren't kidding with okinas. Just add one to the word that means finished, and pau becomes pa'u, a spectacular piece of Hawaiian clothing. And the grandest pa'u of them all will have a rare public showing Saturday at the 5th annual Bernice Pauahi Bishop Awards Dinner. The Bishop Museum benefit celebrates Hawaiian royalty and honors two long-standing community members: James C. McIntosh, chairman of the Harold K.L. Castle Foundation, and Bob Krauss, Honolulu Advertiser columnist and maritime-history enthusiast. Admission to the gala is $200 per person and proceeds will benefit the museum's education programs. In addition to the awards ceremony, there will be a silent auction, dancing at 9:30 p.m., and entertainment by Cathy Foy, Nalani Olds, Misty Tauaese, Les Cebalos, Kamehameha Schools Elementary Jazz Band, and the Royal Hawaiian Band, with all music related to the Hawaiian monarchy. And the pa'u? Just the largest feather cloak ever known to be created. 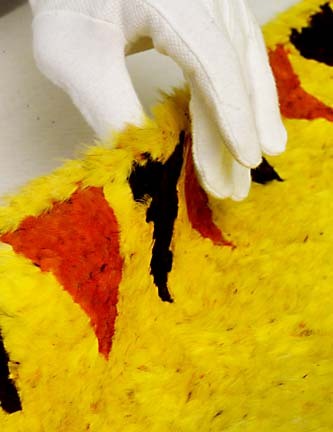 Made of hundreds of thousands of delicate yellow feathers from the extinct 'oo and mamo birds, this particular piece was made for 10-year-old Princess Nahe'ena'ena, a grandchild of Kamehameha I.
Feathers of the birds are shown. First mentioned in 1824, the pa'u was then 20 feet long and 30 inches wide. Nahe'ena'ena wore it by wrapping it around her -- which she didn't much care for. It is recorded that she would run away and hide when ceremonial occasions demanded she wear the pa'u. "The pa'u is really a one-of-a-kind treasure," says Bishop Museum collections manager Betty Kam. 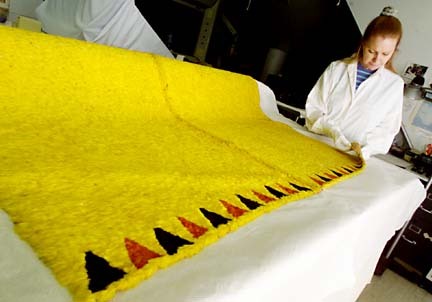 "It is certainly the largest Hawaiian feather piece ever recorded. It is mostly made of feathers from the 'oo bird, with subtle detailing from the mamo bird woven in -- tiny, tiny, tiny yellow feathers with flecks of orange that blend in from afar. The edges have black triangles. It's physically very appealing." Princess Nahe'ena'ena died in her 20s and the pa'u was reconfigured, cut in half and attached side by side so that it is now 10 feet by 58 inches. It began to reappear in Hawaiian history primarily as a covering for the caskets of Hawaiian royalty such as Kalakaua. It eventually wound up in the collection of the Government Museum, the ancestor of Bishop Museum. "The netting is very fine, and the feathers are very full and beautiful," said Kam. Carefully stored in the museum's climate controlled archives, the pa'u's feathers haven't dulled or become brittle. "You have to keep it out of the light as much as possible," said Carla Kishinami, Vertebrate Zoology Collections Manager. "Some cloaks have changed color over the years -- it's the ultraviolet light that causes most of the damage. It doesn't really need to be cleaned, and besides, cleaning would dislodge feathers. We have reinforced the netting a little bit." "There ARE stains on it, but they're part of its history," said Kam. "It's stored rolled up on core of acid-free tissue," said Kishinami. "It will stay there and be transported to the event on the roll, and then laid out flat." "I don't believe a pa'u has ever been displayed like that before," mused Kam. "Laid out like artwork instead of draped like clothing. It's like a big field of beautiful feathers." THE PA'U is not just an artwork, it is a barometer of the natural environment. There are thousands upon thousands of feathers on this one item, and the 'oo and mamo birds that provided the feathers are extinct. Did the ancient Hawaiians hunt the birds into oblivion? The answer, likely, is no. It was actually recent events that wiped out the birds. "The oral traditions say the birds were caught, plucked and let go," said Kishinami. "But biology works against that. There are so few yellow feathers on an 'oo that it's possible to grow the feathers back. But the mamo -- take that many feathers at once and it's doubtful the bird will survive. And we know that the birdhunters also ate the birds." "So ancient Hawaiians were aware of conservation in the classic sense," said Kam. "Use all that you kill, but leave some. That, plus the actual difficulty of catching the birds, mitigated against extinction. "These birds only started disappearing in large numbers with the introduction of the shot, which made it easier to drop a bird at a distance, but also that the bird could not survive. By the late 1800s, the birds were pretty much gone. That, plus the introduction of alien disease and the impact on the forests themselves, wiped them out." Could Bishop Museum go Jurassic Park on us and regenerate the birds from their DNA? "We've certainly got the samples in case that ever comes up," laughed Kam.